This is a sum up of the several different articles I wrote about this species during 1999 and 2000. 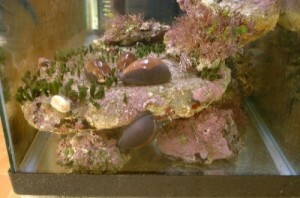 I wanted to try to have some living cowries in an aquarium. As I live in south of France i decided to catch mediterranean cowries. 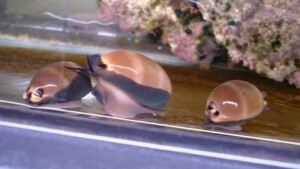 So the first step is... get my hands on some of these shells... I asked around me and nobody could exactly tell me where this species could hide during daytime. My cousin while scuba found many empty shells (with drilled hole) in many different places, a few Cypraea spurca and only one Cypraea pyrum. I tried with friends to snorkle and started to turn rocks and look in the grass fields. But no specimen were found... I had the chance to find an empty fresh dead specimen (with the drilled hole) under a rock though. This was during august 1999. In late september 1999, I decided to buy a flash light and try to have a look in the many crevices along the mediterranean shoreline. We anchored the boat in a rocky creek and I started to look in all the rocks dark holes... this method was successful and this day I found two specimens in two different crevices while the thirs one was laying under a huge rock. All these were found in 0.5m to 4m of water. 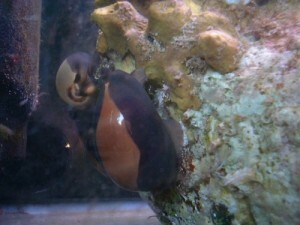 I could now start to introduce my live shells in my brand new aquarium. Of course, I did not put any fishes... just my cowries and a few rocks with algae, crusted algae and many more other stuff on them like mediterranean corals. Let's talk about habits I could notice : In fact, during day time the cowries stay on the tank glasses, mostly near the surface, in the artificial current flow, and sometimes on the water pumps. I think it's because it's easier for them to breathe and the surface water must be more oxygenated. They usually have their syphon facing the flow. On the pumps, they could be sensible to the heat of the engine wich create a warmer water around the pump. The water elsewhere in the aquarium is about 15°C... It's the winter in Mediterranean Sea (12°C). I noticed that they won't hide in any hidden place I created. I started many experiences by moving the rocks. I arranged them in several positions, to see wich configuration would make them try to hide like in the nature. In fact, the best way to create a day hidding place, is to create a single entrance cavern. I must be very dark during the day-time. One day I created the perfect hiding place, with a small intrance, and a dome of rocks. 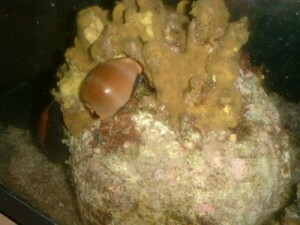 I put two of the cowries in front of the cavern, they both went into it. But that's not the point. 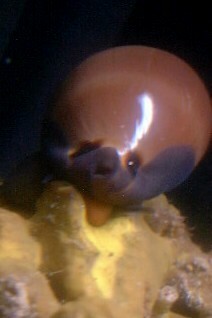 Everyday after, during daytime, one and sometimes two of them were hiding into the new cavern !! I saw them go out during night time. That was a quit good experience. 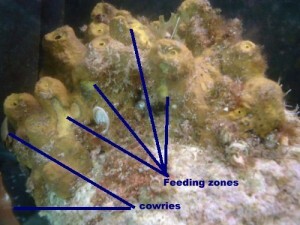 The shells are active as the night starts and seem to look for any feeding zone during many hours. Huge error coming... I decided to modify my strategy and try to introduce many kings of stuff to feed on in the aquarium. We went into the sea, 12°C..., and managed to catch several types of algae, grass and many different sponges. The only sponges I could not introduce in the tank was the yellow one, beacause it cecame all blue when I exracted it from the sea. Its name is Verongia aerophoba... what a good named species... The cyanobacterias living in symbiosis with the sponge causes this effect while in contact with air. So I effectively put all that stuff in the aquarium and went during a week on vacations... my aquarium alone with my parents... a shame. 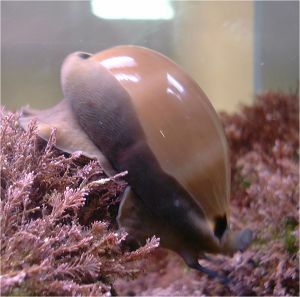 The problem is when you want to introduce something in an aquarium, which is a closed container, you have to do it slowly, meaning you may introduce animal/grass/algae one in a time. So what happened is that a sponge died and the water started to be full of necrosis particules wich killed everything in the aquarium. My parents put the cowries in a small salt water container since I came back. During this step I lost two cowries on the four (I earlier introduced a fourth one) present... A shame ! 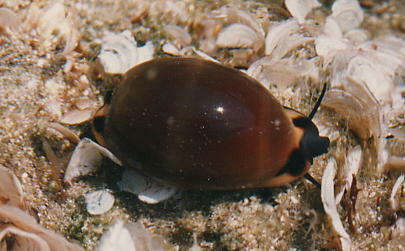 "Since some years ago really very little was known about ecology of Luria lurida.
. Doneddu M. 1999. Some notes about range, habitat and ecology of the Mediterranean species of Cypraeidae. The Festivus 31 ( 8 ): 87-91. San Diego. ( In English ).
. Doneddu M. Classificazione sovraspecifica della famiglia Cypraeidae. 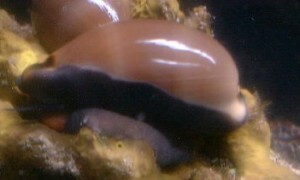 La Conchiglia ( in press, planed for may 2000 ). 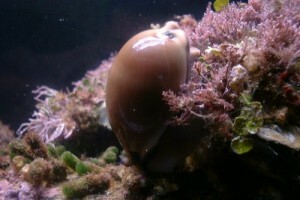 "Luria lurida is very common in Sardinia, where I live, and I observed it feeds only on living sponges of the species Verongia aerophoba I studied this species in nature from 20 years ago, and I noted it feeds only during the night, while during the day it mainly rests below stones or in little caves. I have a large marine aquarium ( 220 litres ) supported by a refrigerating system that keep the water around 19 degrees centigrade of temperature. 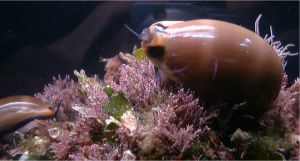 In 1990 I thought to keep some specimens in aquarium, for observing their behaviour. In the beginning I put 40 specimens in the aquarium, but they needed too mach food, and many dives were necessary every month for get the sponges. For this reason I reduced the specimens from 40 to 15 in 1993. 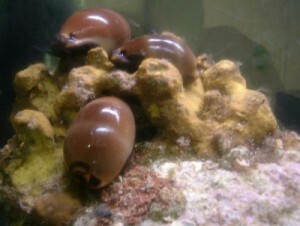 11 years latter I let them in aquarium this 15 specimen are all still living ! 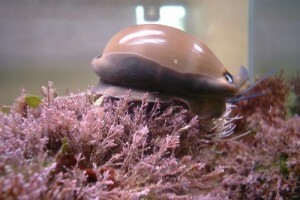 Many inaccuracies were written about feeding of L. lurida: algae, encrusting organisms, dead molluscs, lettuce, etc. 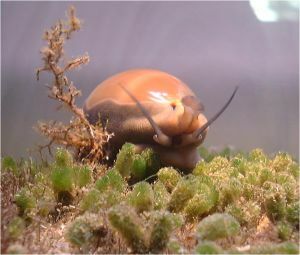 This erroneous data come for a fact : L. lurida can remain without food for 3-4 months, and this gives the impression it have found something to eat. 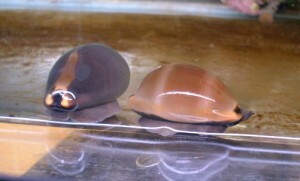 There is a simply but unfailing way to know if the cowry is feeding : always after eating it emits abundant characteristic and striking excrements. These excrements are cylindrical and blue-green in colour. I match L. lurida with many organism, but only on Verongia aerophoba is evident a feeding activity. 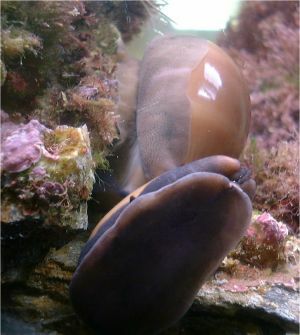 A behaviour like a “browse” on stones in the aquarium, or on the glass seem to be a search behaviour ( probably olfactory organ is in the pharyngeal cavity ). 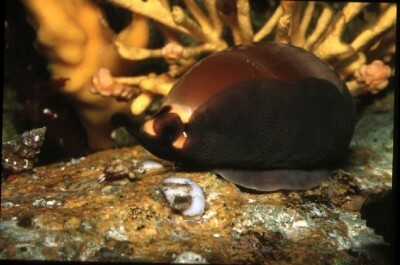 During this behaviour on the glass the radula is well visible, but it is not a feeding activity. 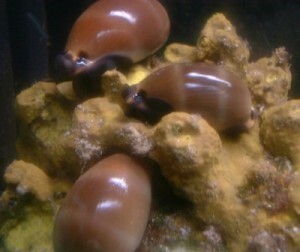 I invite you to put in your aquarium Verongia aerophoba for your lurida cowries, and good observations !" 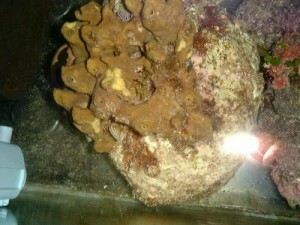 May 2000 I was not so lucky... the only sponge species I did not put in the tank was the one they feed on... But thanks to Mauro, I can proceed t othe final step. Finding the right sponges species was not easy and this sponges lives in colony, and is locally common. But you have to find the colony and may search for it for hours if you are not on the right spot !! 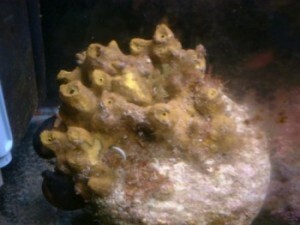 I was wondering if I could find a sponge colony on a medium or small rock in order to put the entire rock in the tank without cutting the sponge. It could then survive in the tank. 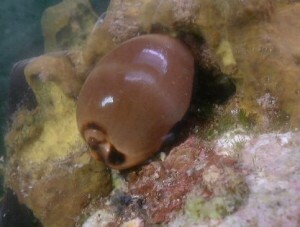 I had a lot of luck this snorkle day and found a "huge" colony on a medium rock with perfect shape !!! 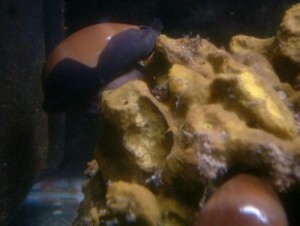 Then I put the rock in the tank without any contact with the atmosphere (very difficult task...). Then I put my all three Cyp. lurida near the sponge... and... miracle ! they started to feed even in the daytime !! They were angry, surely, but anyway it was a very big joyce to see them feeding so much on the poor sponge colony... 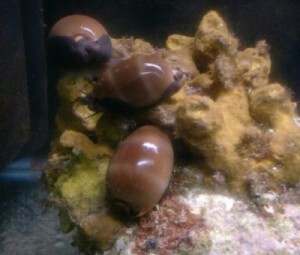 The next day, during daytime they hide just under the sponge on the dark side of the rock. They prefered to stay close to the sponge I guess. Comment from M. Jean-Pierre Biddle (France) January 2001 (French) J'ai visité votre site concernant Luria lurida. Bonne initiative. piratés ça et là. Je plonge (photo) mais je ne suis pas un collectionneur de coquillages. 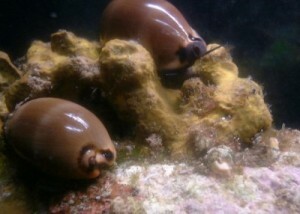 Les mollusques m'intéressent, autant les Cypraea que les Chitons ou autres. environnants (spongiaires, cnidaires...). Ce sujet m'intéresse. Je l'ai expérimenté (in-vivo) avec succès sur un Ovulidae Neosimnia spelta. 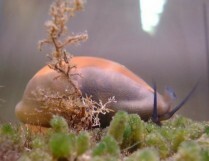 En photo, une lurida dans 5 cm d'eau (après mistral).